Signature Bank of Georgia Unveils Client Engagement Center and Universal Banker Implementation | Locally owned and operated community headquartered in Sandy Springs, Georgia. Sandy Springs, Georgia, March 6, 2019	(Newswire.com) - Charles Hoag, Chief Administrative Officer, is pleased to provide an enhancement to clients visiting our Sandy Springs location. “The team at Signature is dedicated to evolving as needed. The determining driver we consistently monitor is the voice and needs of our clients.” With this in mind, Signature Bank recently executed on their pledge to exceed client expectations for convenience and flexibility. 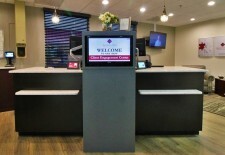 In the newly designed Client Engagement Center located at 6065 Roswell Road, Suite 110 in Sandy Springs, the facilities layout was reconfigured to be more conducive to a one on one conversational approach to banking, bringing the Banker out from behind the desk or teller counter and offering more hands on and demonstrative assistance.